MASSIVE 148 PAGE ISSUE #80 OF FIREWORKS out now! The Autumn issue of Fireworks comes out next week, another 148 pages jam-packed with Hard Rock and Metal goodness! 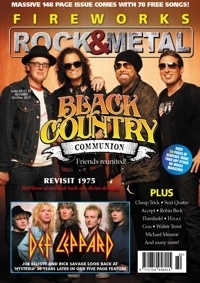 This issue's cover feature sees us sit down with Glenn Hughes for a detailed and honest look into the reformation of Black Country Communion and their superb new album. Elsewhere we have interviews with Cheap Trick, Suzi Quatro, H.e.a.t, Walter Trout, Cats In Space, Threshold, Kenny Wayne Shepherd, Accept, Tony Martin, Michael Monroe, Gun, Robin Beck, Steelheart, Janet Gardner, Masterplan, Coldspell, Boulevard, Da Vinci, Martina Edoff, Nocturnal Rites, Newman, Eden's Curse and many more, including a five-page interview with Joe Elliot and Rick Savage as they look back at the recording of 'Hysteria' 30 years ago. Interviews, features, reviews and 78 FREE songs: LET'S ROCK!